As spring rolls around we enter the first round of indie films, which is my favorite movie season of the year. Touched With Fire, from first time feature film director Paul Dalio, tries to balance a delicate love story of bipolar psychiatric patients, Carla (Katie Holmes) and Marco (Luke Kirby). Carla and Marco are both poets - neither are very good. Both suffer from bipolar disorder and are off medication. We travel a year in their lives through ups and downs and checkpoints in their relationship. Dalio handles bipolar disorder in his script less like a study or exploration and more as a "how to live" guide, which proves to humanize the disorder while also limiting the story. The character's passion for poetry and artistry suggest that there's a connection between artistic genius and bipolar disorder although Dalio's script and filmmaking prowess are never quite able to articulate this to the audience. The character's struggle is apparent and well acted but never is their pain or euphoria firmly felt. 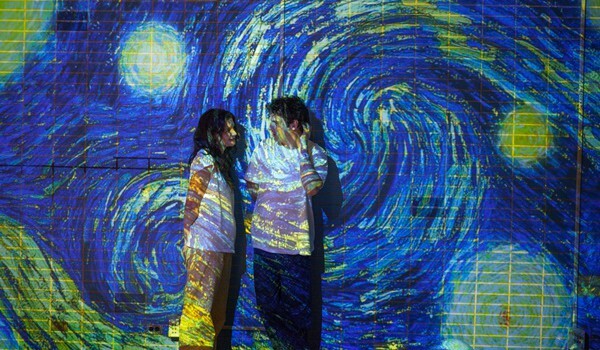 The result is a well meaning but artificial document of bipolar through the lens of a love story. Dalio is able to show us a relationship with conflicted people when they're at their lowest levels, but this is just one shade of a color that is ever changing and growing. It's a love story that forgets the romance and high of falling in love. Without a contrast to the somberness, the film is rendered ineffective in getting the audience to invest in the dramatic conflict of the character's relationship. Carla and Marco are indeed complex people but their relationship is hardly such. This is the type of film that could quite easily fall into the Sundance pit of eye rolling #WhitePeopleProblems, but Dalio's own experience with bipolar disorder informs the film, and despite rough edges, there's a clear passion hidden somewhere inside that occasionally ripples on the surface. For that we can credit the lead performances. Has Katie Holmes been in hibernation since 2005's Batman Begins and Thank You For Smoking? Once upon a time she was an "It girl" and I have always thought she was one of the better actresses to come out of the late 90's teen TV drama wave. Her return to a proper indie sensibility mixed with Dalio's subject matter gives Holmes a nice platform for a subdued performance. Luke Kirby's Marco is the more wild of the two character's and his talent quietly erupts off screen. I highly suggest watching the fantastic Take This Waltz (2012) if you've not seen it. An A list director will soon be knocking on his door. While both performances are good, much of the dialogue feels awkward and takes away any chemistry Holmes and Kirby had while also standing in the way of the emotional authenticity that it aims for. The script’s intentions are in the right place but it too often rants on and comes off as confused. Dalio's film is created out of love for it's characters and their battle with bipolar disorder, but it's script and filmmaking is far too stiff and narrow to let it's content of poetry and fizzling emotions reach it's emotionally poetic ambitions. Though I suspect those with personal or familial connections to bipolar disorder will engage with the film more than me. Holmes' performance is a nice reminder of her talent but Luke Kirby's emotive performance is reason to perhaps watch at some point down the line. Touched With Fire never evokes the feelings it depicts, but the fine performances help to at least shine a light on the subject of mental health that still needs awareness. Touched With Fire is out on limited released in the USA. No UK release date has been announced yet.